The plant is expected to become a top destination for tourists, who can look forward to being guided around the showcase site by a unicorn with liberal sprinkles of magic dust. “Earth Hour was first unveiled by an Australian ad agency in 2007, when global atmospheric concentrations of carbon dioxide had reached 385 parts per million, their highest level in some four million years. Since then, CO2 levels have broken through the symbolic 400ppm barrier and continue to rise sharply. The impact has been stark. Eight of the 10 hottest years ever recorded have all occurred since 2007. Last year smashed all previous records, pushing Earth systems into what the World Meteorological Organisation this week called ‘truly uncharted territory’. Blogging on battery power seems a decent analogy for stealing resources from our future selves. “Offline [nuclear] reactors could lead to a ‘tense situation’ for energy supply in France, in the event of a cold snap this winter. ‘Brexit means Brexit’ means severing all connections to the continent. Create an electronic system that costs more to install and run than it saves, falsely inflates bills, collects unnecessary personal data about households, and emits unhealthy levels of radio-frequency electromagnetic radiation in homes. Label it ‘smart’. Job’s a good ‘un. 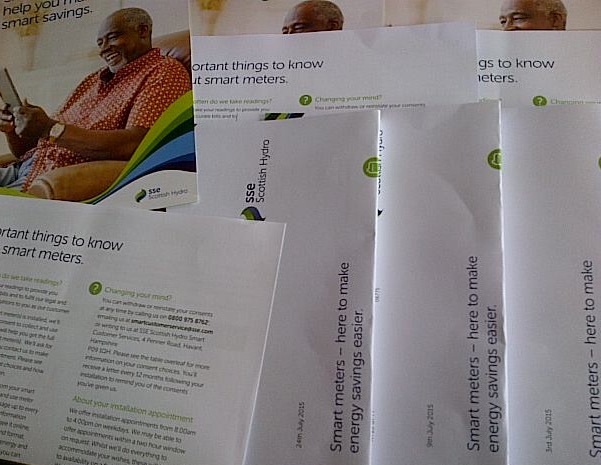 Plus, in the case of Scottish & Southern Energy / Scottish Hydro Electric, issue identical advertising letters and leaflets to customers three times in one month to overwhelm any concern about unnecessary costs. Snappy name: car-bon, like ‘good car’. Have I stumbled upon the fossils fuelling this oxymoron? Or am I just another fool who’ll be paying it? Apples are often green. Clouds generally lack transparency. In Scotland, Stratus Power and productivity will continue entirely unabated.